On Saturday we took the long ride south and slammed limits of cod and all the pollack the guys wanted to take. Played catch release on keeper cod for about 2 hours after our limit was in the box. Stayed away from the fleet but still managed to get mugged by bent rod seakers...just the way it is down there. 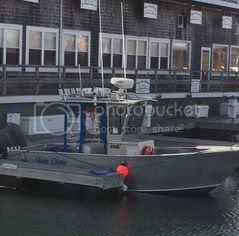 The nice thing about fishing out of Gloucester is that I have within my range 4 major pieces of bottom to fish so when I get tired of the neighborhood I move. On Sunday I fished by myself, not another boat in site, and crushed cod and pollack until my guests called it quits around 1100! 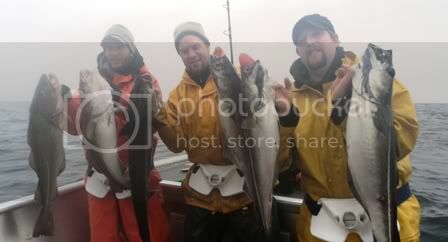 Fish were on the herring and of much higher quality than the day before...only 8 short cod taken in 4+ hours of fishing. Pollack to 15lbs and cod to 20 made for the best trip of the season. Another week of NE winds and rough seas predicted but hopefully we can get on them again next weekend. How deep are those guys and do they tug pretty good?